We got some interesting feedback. Some good, some not so good but in general we got what we were expecting. We ordered two paid reads on the blcklst (the Blacklist) and received two very different reviews (so different that even the blcklst) thinks something is off). Even though they are very different the review pointed the same things out, one of the readers just thought our story has more potential and liked our execution better than the other one. We are aware that “Saber Rider” is a hard sell but we are certain that (if executed correctly, including a lot of rewrites) it has the potential to be awesome and very lucrative. So, what do we do now? Well, I have no idea. I agree with some of the weaknesses discussed but I strongly disagree with some other points both readers made. So how do I choose what to do and what to ignore? Sure, there’s “kill your darlings” but that can’t be the only answer. It’s probably one of these “the truth is in the middle” scenarios. There was one point both readers raised and even though we deliberately decided not to go that route in the beginning it’s probably time to accept that we have to adhere to some conventions of the genre and fulfill some of the expectations the audience (or the reader) has. So we decided to rework the Saber Rider character. We had an interesting (but controversial) idea and I will implement the changes in the next couple of weeks. Ian Glen as Saber Rider? So, what is that idea? We decided to age Saber. 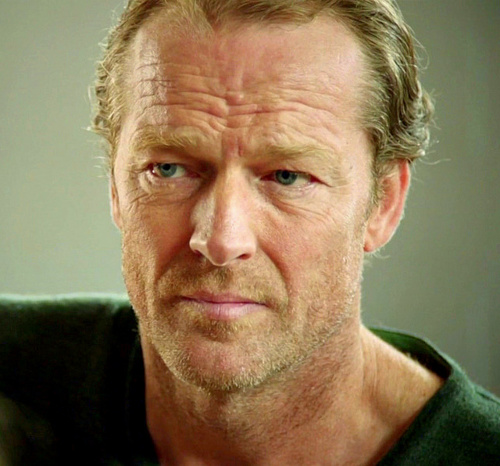 I had the Idea while surfing the “interweb” and I came across a picture of Iain Glen, Jorah Mormont in Game of Thrones. For some reason I started to see him as an older Saber. So why would an older Saber be a good idea? Well, we think that an older Saber adds some depth to the character, his backstory gets more interesting and we can introduce him as a veteran of the first war who still has some unresolved issues that haunt him. We envision him as someone who lost his way but gets an opportunity to either loose of completely or get back on the horse and become the man we know and love. Some fans might not like the idea of an older (we are talking mid 50ies) Saber Rider but we hope that once Colt starts cracking jokes about Sabers age (which happens about 2 seconds after they meet for the first time) they’ll accept out version of the character. An older Saber also adds some depth to Fireball. Saber knew Fireballs father with could lead/leads to some tension but also allows for some interesting character developments. As for April and Jesse, well they met Saber at the Academy. He trained them which makes it more natural that she trusts him and Jesse has even more reasons not to like him. But one question remains, why didn’t Saber have the great career he deserved? I don’t want to spoil too much but he suffers from survivors guilt. Now I have definitely said enough. I need to get back to writing now. Check back in a few weeks.